United Airlines will increase the number of flights offering free entertainment that passengers can access via their personal devices. 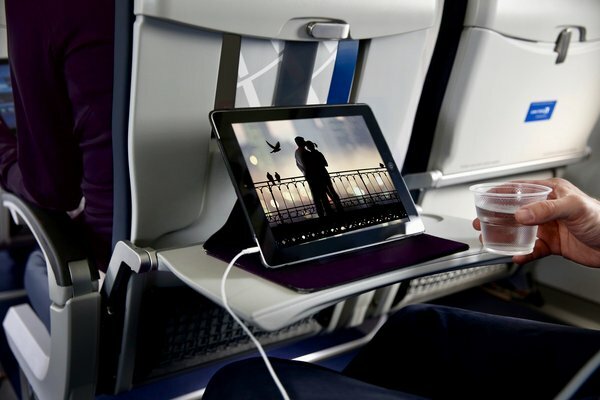 That expansion reflects how consumers increasingly use their mobile phones or tablets for entertainment on flights rather than rely on the DirecTV seat-back option that once was a radical and welcomed piece of technology on planes. It also reflects how consumers now watch content when their feet are on the ground. The airline also said it will give passengers free cardboard phone stands that will prop up smartphones so passengers can use their seat back trays and watch hands-free. And it said it is continuing to install in-seat power outlets so passengers don’t drain their phones while using them to watch videos on their devices. United expanded its personal device entertainment option to all planes that already offer DirecTV live streams on their seat backs. Now, on any wifi-equipped aircraft (that’s all United planes that hold more than 70 passengers), United will provide free entertainment, from movies and TV shows to music videos from Vevo, that fliers can access on their own devices. The company said that in the last three months it built personal device entertainment capabilities into more than 200 aircraft that were previously limited to DirecTV. Right now, accessing that DirecTV screen ranges in price from $4.99 to $7.99 per passenger. The DirecTV systems are expensive to install and maintain and add weight to aircraft and, increasingly, consumers prefer to be left to their own devices, from smartphones to tablets. The airline already offers United Private Screening that gives passengers on some flights a roster of entertainment choices to be viewed on personal devices. But that service, until now, wasn’t available on planes that offered DirecTV. "We're excited to expand our personal device entertainment offering, which has been a popular option amongst many of our customers who tend to bring their own devices when they travel,” said Mark Krolick, United’s vice president of marketing, in a statement. United isn’t the first airline to begin to move away from seat-back screens. Delta and American Airlines are cutting back, too, and not adding the screens to their newer planes, according to various reports. Delta Airlines was first to make all in-flight entertainment free in June 2016. At the same time, United said it was expanding its entertainment options for passengers with hearing or sight disabilities. The airline has begun a category called Accessible Entertainment available on seat-back sets, that features a handful of titles that are either audio descriptive or closed captioned. That service is only available on some aircraft.